Chicken soup is about as exciting as my Friday nights get nowadays and this week I made a delicious, quick, warming chicken soup that was so welcomed in this freezing cold weather we are experiencing in North Carolina. The thing about a Friday night leftovers soup is that it is so customizable to whatever you have on hand, and will probably be delicious no matter what. For this soup, I used up a lot of odds-and-ends of vegetables sitting in my crisper drawer, as well as the last bit of a rotisserie chicken from two nights before. I encourage you to try some different things than the usual carrot/celery/onion in your soup. For example, I added some mushrooms, green beans, and a sweet potato. Perhaps a little non-traditional, but let me tell you it has so much flavor! Don’t have green beans, but have a bell pepper instead? Cool, throw it in! Have kale instead of collards? Perfect! Don’t have chicken, or you’re a vegetarian? 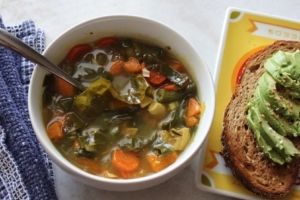 Canned beans or some lentils would be amazing in this soup instead. Moral of this story is: you do you. Here’s my other tip for soup: in order to actually help make it filling, focus on getting a protein source (chicken, beans), carbohydrate source (sweet potato, noodles, rice), and lots of fiber from vegetables (i.e. the more the better). This will make it a more complete meal and help you actually feel satiated afterwards. Also, best served with some cheesy garlic toast or avocado toast in my opinion! 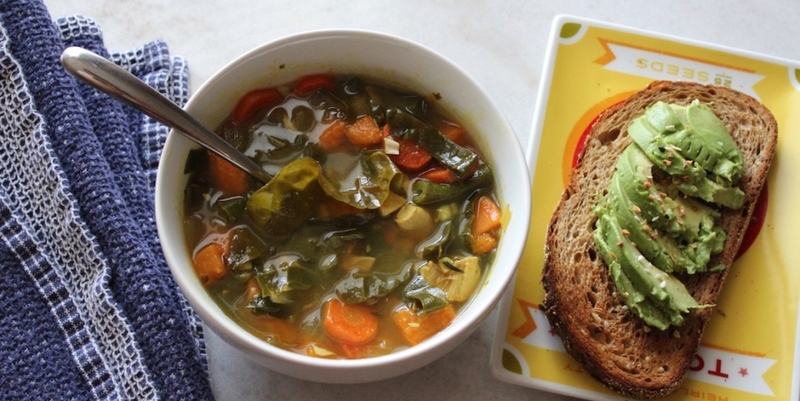 A tasty, one-pot chicken soup made with leftovers. Peel and dice the carrots and sweet potatoes into small pieces. Add in the sweet potatoes and carrots and let them cook until starting to get tender, and slightly browned on the edges (any browning gives the soup even better flavor). After about 7 minutes, add in the diced onion and cook until they start to soften, about 3-4 minutes. Turn down the heat to medium or medium-low. Next, add in the garlic, mushrooms, and green beans along with all of the spices, and saute for a few more minutes. Once all of the vegetables are getting soft, add in the chicken broth and diced chicken, plus the strips of collard greens. Let everything heat through together, add more spices to taste, serve, and enjoy!